Last week we reported that Apple had emailed all iTunes Affiliate Program members to inform them that its commission rate for all apps and in-app content would be reduced to 2.5 percent on May 1, down from 7 percent, globally. The news came as a blow to app review and discovery websites like AppShopper and TouchArcade that depend on the commissions to generate revenue. However, this morning MacGamerHQ posted an email communication from iTunes Affiliate Support that casts doubt on Apple's original announcement. The message above was received in response to a query about whether Mac apps would be impacted by the commission changes. 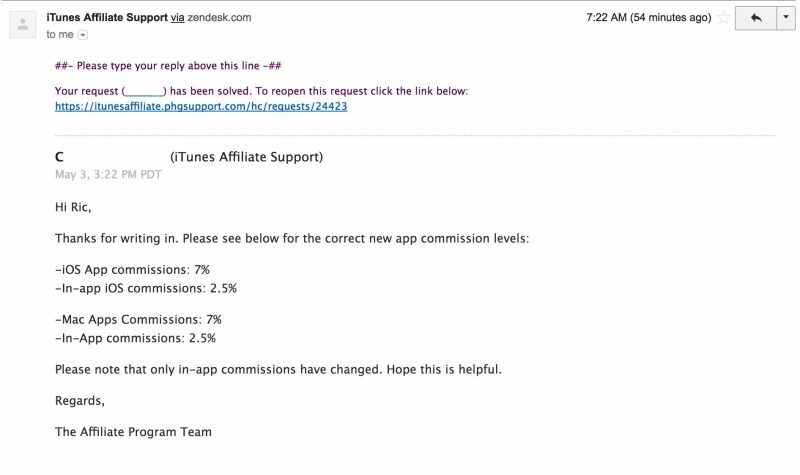 As shown, the email states that iOS and Mac app commissions remain at 7 percent, while only in-app commissions will fall to 2.5 percent. If the affiliate team's information is accurate, then the change in commissions does not apply to individual app purchases, as Apple originally stated. MacGamerHQ notes that several affected site owners and bloggers are still seeing 7 percent commissions come through for iTunes affiliate links, despite the fact that the changes were meant to come into effect on Monday. We'll make sure to update this post if/when Apple clarifies the situation. Update 5/8: Apple has confirmed in a note on its Affiliate Resources website that the commission rate change only applies to in-app purchases (2.5 percent, down from 7 percent). All other rates remain unchanged. I'm cynical today, it strikes me that this wasn't news before and still isn't and the only reason MR is covering it is due to the impact on your sister company. Personally I've just been annoyed the handful of times I've clicked an app link here and been dumped onto app shopper rather than iTunes App Store. Pretty harsh. In my experience MR always provides [direct links] to the App Store alongside App Shopper links, and it states them as such. Just look for the square brackets. I'd like to see you try keep a site like MR running, as a healthy business not to mention too. Personally, I'd rather see ref links over banner ads any day of the week, they need/use both and it's alright I think. You're getting plenty for the zero dollars you spend here and I'm super fine with them getting kickbacks in a neutral way (ref-link over sponsorship) from these app links. When it comes to IAP, I think Amazon Underground has it absolutely nailed. If you've never heard of it: imagine downloading Candy Crush, but you can get any unlimited amount of IAPs without actually having to pay any money for them. Amazon then pay developers based on minutes of in-game time. This then means that people play a bloodsucking game like Candy Crush and blast through all the levels within about 20 minutes. They realise it's a crap vacuous game without any substance, delete it, and never play it again. If Apple did something similar it would be an incredibly aggressive move, yet nothing but a good thing IMO. I feel such a move can only encourage more quality apps and better developers in the long term. Kinda agree, too bad the Underground will be shut down this Summer though. Ditto on the good news. I wonder if this is Apple trying to drive a stake through the heart of freemium apps while encouraging for-pay apps? Well if that's their plan, MR is doing a pee poor job of generating negative press. Your opinion is your opinion. I am not here to change it. Just observing how much of a stretch it takes to have that opinion, especially since absolutely nothing points in that direction. To each his own. We'll agree to disagree. Thank you for being civil :-) sometimes seems rare around here. Does this mean that Apple takes less from developers? Or that the developers get less? I stand by my statement, I think it's entirely fair to point out a potential link between story selection and direct (to the parent company) financial gain. It would be fair to point it out if MR and other affiliate sites were the only ones reporting this story. They are not. In fact, you'd be hard pressed to find any Apple-centric site that didn't report this exact story. The implication of ulterior motives should, at a minimum, contain some connection to supporting evidence. Your implication contains none. Consider the long term implications on the Apple ecosystem. Let's examine the implications of diminished IAP. It's by far and away, the largest revenue generator in the app store. What is going to replace it? Remember, Apple is trying to grow the category, not shrink it. How is that going to affect the stock? Apple isn't going to throw away continual daily income on the hopes that single purchase apps are going to somehow grow sooooo much in popularity that they will counter the lost revenue of IAP. Like it or not (I'm firmly in the not camp) the customer base has spoken. IAP is their preferred method of wallet draining, and that is the biggest hurdle Apple would have to overcome to take the app store in a different direction. They aren't jumping that hurdle. Why would they? The problem is that iaps tend to be skewed towards games, which can in turn discourage the development of quality productivity apps as developers flock to where the money is. You're going to have to walk me through this logic. There are no correlations that make this work. There are literally hundreds of thousands of business and productivity apps in the app store. There is no dearth of app development for business/productivity apps. It's the 2nd most popular category on the app store behind games. There is also no correlation between more devs and more quality apps. IAP has been the financial driver in the app store for a long time. If devs were going to flock to where the money is, wouldn't they have already done it? Do you want your iPad to be stuck as a hearthstone device forever? That's not a healthy market scene at all. Both my iPads are sitting in a drawer collecting dust along with my Android tablets. Tablets have lost their appeal in my household. But when they did play a part, it was in the role of consumption device.